The best kind of California cannabis consumer is an informed California cannabis consumer—particularly when it comes to the rules and regulations within the Golden State. 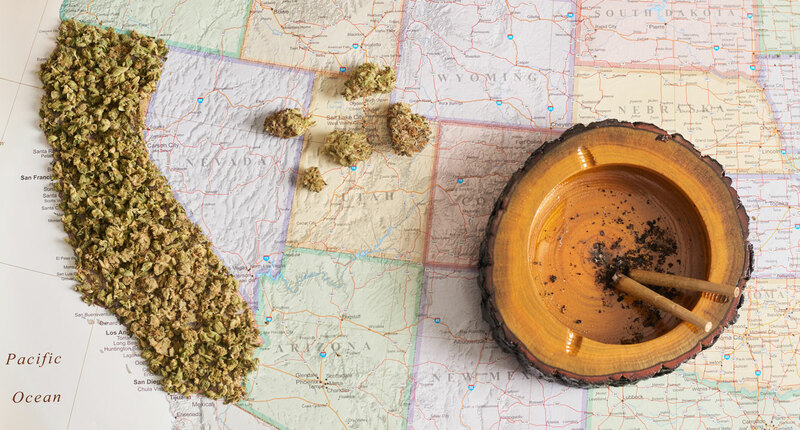 Whether you’re a bit confused when it comes to the amount you can purchase or you’re wondering if that outdoor cannabis-centric picnic can actually happen (spoiler: it cannot), we’ve got a handy rundown of local marijuana laws. Let’s get to the basic rule right away: adults over the age of 21 are legally permitted to purchase recreational weed all across California, as long as you’re in a licensed shop or dispensary signified by the state’s Bureau of Cannabis Control and have your ID, of course. Once you’ve got access the goods in your nearest shop, there are specific regulations around how much of the flower one can actually possess. By law you can buy and possess up to 28.5 grams—which equates to a little over an ounce—of cannabis and up to 8 grams of concentrate. Looking to grow? Any person over 21 can posses, plant, cultivate, harvest, dry, or process up to six live marijuana plants as long as they are kept out of public view. As for that cannabis-filled day outdoors: not going to happen. Whether you’re using for recreational or medicinal purposes, it is illegal to consume weed in public, in any way, shape, or form. And the same goes for a vehicle. No smoking, vaping, or eating cannabis while sitting in a car for both the driver and passenger. On a boat, aircraft, train, spaceship or any other form of transportation? Leave the cannabis at home because it’s not allowed to be consumed. You can, however, travel with cannabis as long as it is in a sealed container or in the trunk of your car. But no crossing state lines: that’s a big no-no considering marijuana is not federally legalized. So where can you consume your new favorite strain? On private property, as long as tobacco smoking is not already prohibited. If you rent and your landlord has stated that smoking cigarettes is not allowed on the premises, then you may be out of luck. Another rule to keep in mind: you cannot ingest, posses, or smoke marijuana within 1,000 feet of a daycare, school, or youth center while children are present. And there you have it. The basics behind California cannabis laws. Now, go forth to your closest MedMen marijuana dispensary and share your new knowledge!